First Team introduces the Blast outdoor volleyball system. 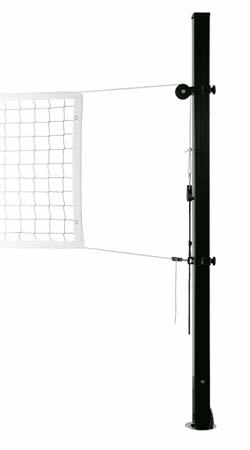 First Team's Blast volleyball systems are designed to offer high quality performance, durability, versatility and safety all in one affordable package. The 4" square steel powder coated uprights can be installed outdoors for either sand or grass volleyball courts. The infinitely adjustable net height from 7’ 11 5/8" (men's competition height) down to 3' (tennis net height) makes the Blast a great unit for all ages and all types of net games. Our simple net tensioning device makes setting up the unit quick and easy providing competition level net tensioning. Installation can be permanent by cementing posts in place, or post can be made removable when used with our FT16 sockets for sand. First Team offers the Blast volleyball system in an array of configurations. Select from packages with or without padding, sleeves, etc. All Blast volleyball systems are covered by First Team’s Lifetime Limited Warranty. When you are searching for the best in affordable volleyball systems, choose First Team and have a BLAST!